Normally, I don't do this, but this story is so bizarre, I am going to post the entire article as it appears at metro.co.uk. This is not the only news service that has picked up the story. Police in Nigeria are holding a goat on suspicion of the attempted armed robbery of a Mazda 323. Vigilantes took the animal to the police, claiming it was a criminal who had used black magic to transform himself into a goat to escape arrest after trying to steal the car. Police have detained the goat in custody while they ponder what to do next. Kwara state police spokesman Tunde Mohammed said: "The group of vigilante men came to report that while they were on patrol they saw some hoodlums attempting to rob a car. "They pursued them. However, one of them escaped while the other turned into a goat. "We cannot confirm the story, but the goat is in our custody. We cannot base our information on something mystical. 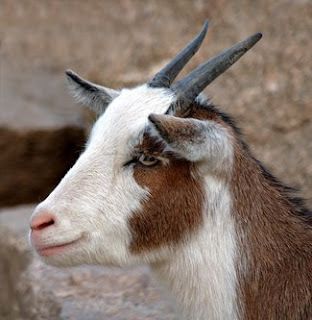 It is something that has to be proved scientifically, that a human being turned into a goat." Curious locals have rushed to the police station to see the goat, photographed in one national newspaper on its knees next to a pile of straw. Bad news for the prosecution-- he can also change himself into a lawyer.